Some people think beans are evil and unhealthy. I am not sure about that but I like them. Some people think beans are one of the healthiest foods we can eat. I am not sure about that but I like them. So I eat them for now, unless I decide I don't like them or I am convinced that they are evil and unhealthy. I made homemade hummus today. Have you ever soaked chickpeas? 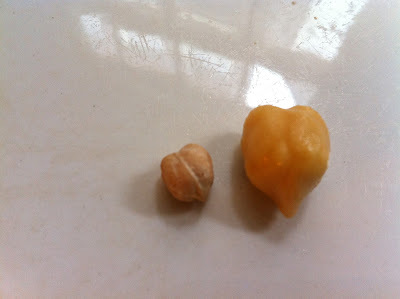 (garbanzo beans for you Americans) Check this out! After just soaking overnight they more than triple in size! That's a bargain food in my book. Imagine soaking your cash overnight and it triples in quantity, wouldn't that be nice? So I made hummus without adding oil. Most would say this is not real hummus, and I can live with that. I'm just trying to avoid processed food right now and even olive oil is not a whole food. I made the hummus with chickpeas, tahini, lemon juice, water, a dash of salt, and a bit of cumin. 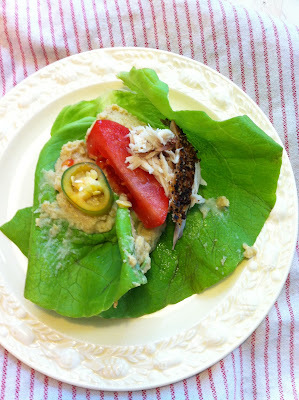 Then I slathered it on a piece of lettuce, topped with sliced tomato, sliced serrano chile, lime juice and some smoked mackrel. Roll it up and stuff it in your face! Have you had smoked mackerel before? I haven't, but it is gooooood! A source of omega-3 fatty acids and it is supposed to be a sustainable fish. Well, the package said duurzame, so I hope they aren't lying! A yummy lunch or snack, and you could even play around with the presentation and make it into a nice canape for guests. It's even better with some fresh herbs like mint or cilantro.